Welcome back for another installment of my Comic Book Fan Casting. This time around I am going to focus on a series by one of my favorite writers, Garth Ennis. Ennis is a writer who knows how to make a series both over the top and poignant. A group of altered humans are the only barrier the world has to keep the super powered “Heroes” of the world from going out of control. And they are allowed to use any means necessary to get the job done. Filled with a lot of characters that are obvious references to DC and Marvel heroes, but way more questionable, this book makes for some real fun. This is a tough call. There is a good amount of action, comedy, and graphic violence. Quentin Tarantino has a real knack for making things work with a perfect balance of all genres, even when it shouldn’t by all rights. It would also be interesting to see what Tarantino could bring to the table to make the series slightly his own. 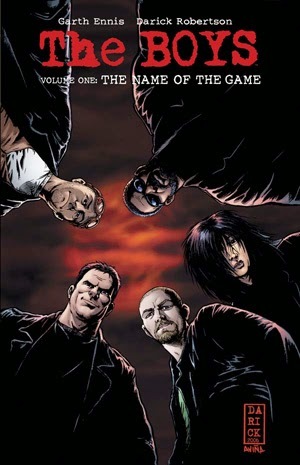 After all Garth Ennis is in many ways the Quentin Tarantino of comics. The newest member of the team and an Scottsman, Hughie is getting over the death of his true love at the hands of a careless superhero at the beginning of the series. Hughie gets thrown into the middle of the war between the heroes who take no responsibility for their actions and The Boys who make sure they pay for their transgressions. This is an easy casting. The character was drawn to look like Simon Pegg, and he would fill the role perfectly. The leader of the team and longest standing member of the team. Butcher is an englishman known for being overly violent and rather crass with his humor. Not to mention he is extremely fond of his dog Terror. I would like to see Clive Owen take on Butcher. He has the size and the attitude to make Butcher the force that he is in the book. The only American on the team. Mothers Milk is a large African-American who is very patient and methodical. Milk is also the only member of the team to have been on Compound-V since birth. His mother was exposed by working at a former factory that produced Compound-V but was poorly cleaned afterwards. The early exposure makes him dependant on getting doses of his mother’s breast milk, hence the name. Michael Jai White would be a great Mothers Milk to me. I have always thought he was a great actor even if some of his movies weren’t that great. The Frenchmen is bit of a loose cannon, who has no problem getting some blood on his hands. He speaks very little english, though even his French is rough most of the time. He takes a quick liking to “Petite Hughie”. Often calm and caring, if provoked he can become a violent maniac in no time. On this one I need to go with my good friend Tony, and go with Guy Pierce. He has a great ability to play all of the different facets of the Frenchmen really well. And I always get a kick out of seeing Pierce play a psychopath. A young Japanese girl who is mostly mute. The Female is the real muscle of the team. She is a true psychopath, and has been acting as a hitman for the mob while the team was disbanded. She hates being touched, except for by The Frenchmen for some reason. I feel that Chiaki Kuriyama could be good casting choice for this part. She put in a couple great performances as Takako in Battle Royale and Gogo Yubari in Kill Bill Vol. 1. But it is the part of the young kill hungry Gogo that shows why she should be The Female. As always, thank you for reading my Fan Casting. If you have comments or suggestions on how to improve my Fan Casts, please feel free to comment below.